Preheat oven to 425° degrees. Melt half of the butter in 10 inch cast iron skillet set over medium heat; cook peaches and cinnamon for about 5 minutes or until heated through. Stir in brown sugar and lemon juice. Sprinkle cornstarch evenly over top. Cook, stirring occasionally, for about 8 minutes or until peaches are soft and tender and juices are slightly thickened. Meanwhile, in large bowl, whisk together flour, granulated sugar, baking powder and salt; using a pastry blender or fingertips, cut in remaining butter until mixture resembles coarse crumbs. In separate bowl, whisk together milk and vanilla; stir into flour mixture until just blended (do not overwork). 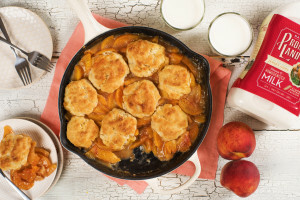 Drop dough by large spoonfuls on top of peaches. Sprinkle sugar over dough. Bake for 15 to 18 minutes or until biscuits are golden brown and set, and filling is thick and bubbling.